Gemco has been supplying Rotary Cam Limit Switches (RCLS) to the U.S. Army Corps of Engineers for more than 45 years. Our Series 1997 Gate Hoist RCLS was designed exclusively to the specifications supplied by the USACE. Over the past 45 years, we have provided thousands of these units throughout the world for feedback and control of dam roller gate, miter gate, and lock chamber valve machinery. Factory Automation is committed to this industry and stand behind every unit we build; they are of the highest quality, most robust, and competitively priced units on the market. AMETEK/Gemco has more experience, knowledge, and expertise with these types of applications than anyone in the industry. Previous nonmetallic cams have been designed and approved by the USACE, and we have supplied them accordingly. We are now taking our proven design and providing a metal cam per the USACE specifications. 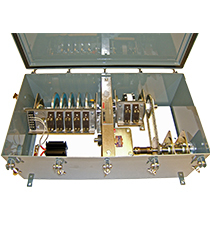 These units are designed to function according to specifications and to last for years, the switches alone are designed to survive fifteen million cycles.